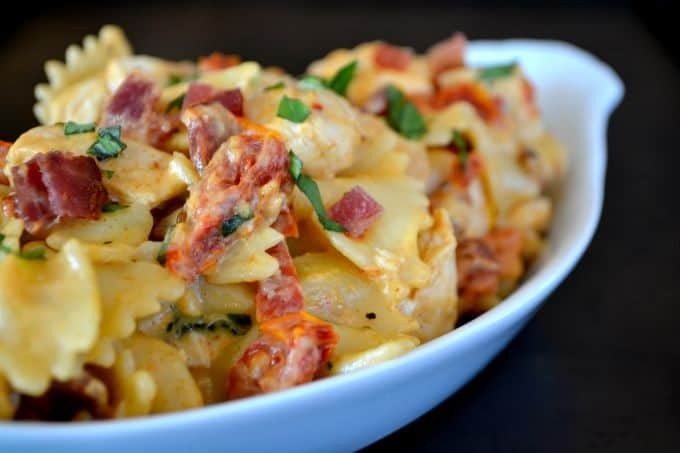 Chicken Mozzarella Pasta – farfalle pasta tossed with some seasoned cooked chicken tenders, sun-dried tomatoes and bacon in a creamy mozzarella sauce. An easy and delicious weeknight dinner. How’s the end of your summer going? Have you adjusted to the back-to-school routine or is it still a struggle to get the youngin’s up in the morning? And how’s the afternoon homework going? As you may know, our son graduated high school in June. I must say that it’s really odd to not have to deal with the drop-off line in the morning, the homework deadlines, and the shuttling to and from practices, games, etc. Although the one thing I really miss is seeing him and his friends running on the cross country and track teams. It was so much fun to go to all the events and see kids from across the state and even country competing. There are so many talented children out there, it just amazes me. I was browsing Pinterest the other day for dinner ideas when I came across this incredible looking recipe and just knew I had to make it that night. Needless to say, the family wasn’t disappointed. I also added a little bacon to it because everything’s better with bacon, right? It just looked oh, so good as it was all coming together! 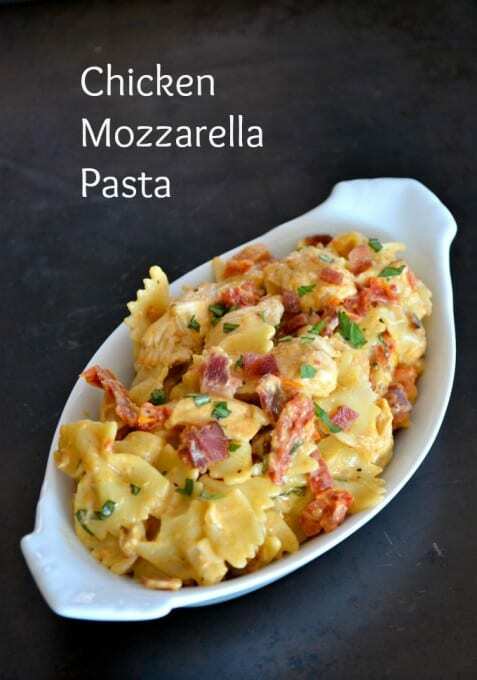 Use these items to make your own Chicken Mozzarella Pasta – skillet, sun-dried tomatoes, and slotted spoon. 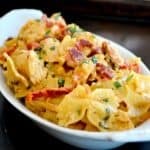 Farfalle pasta tossed with some seasoned cooked chicken tenders, sundried tomatoes and bacon in a creamy mozzarella sauce. Drain the sun-dried tomatoes from the oil and reserve 2 tablespoons of the oil for sautéing. Chop the sun-dried tomatoes into smaller pieces. In a large skillet over high heat, sauté the minced garlic and sun-dried tomatoes in the 2 tablespoons of reserved oil for about a minute. With a slotted spoon, remove the sun-dried tomatoes from the pan. Season both sides of the chicken tenders with salt and pepper, and evenly distribute the tablespoon of paprika among them. At this point, it may be necessary to add a small amount of olive oil to the skillet. Add the chicken to the pan and with the heat on high, cook on each side for one minute. . 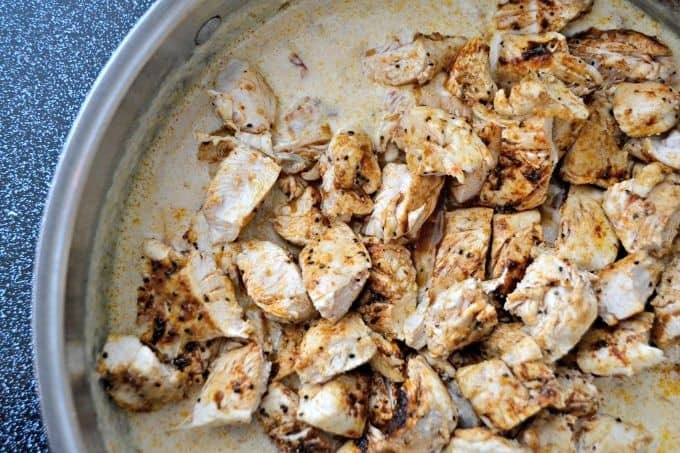 Remove from heat and cut chicken into bite-size pieces. Cook farfalle according to manufacturer's directions. Remove 1 cup of pasta water and drain the pasta. Return the chopped sun-dried tomatoes and the chicken to the skillet. Gently pour in the 1 cup of half and half and add the mozzarella. Bring to a slow steady boil. Reduce heat immediately to a simmer and stir constantly until cheese melts forming the sauce. Add the cooked pasta to the pan and mix until thoroughly combined. Add the basil, and red pepper flakes (more if you like an extra kick!). 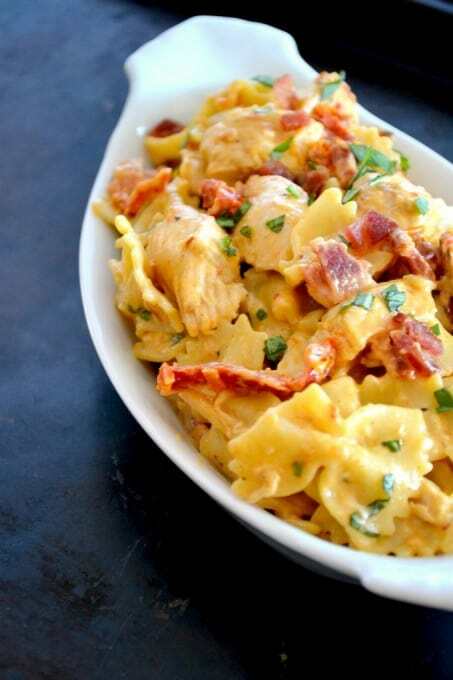 Slowly pour in approximately a 1/2 cup of the pasta water to thin the cheese sauce, making it creamier. Be mindful to not add all the water all at once, use your judgement as to how thick or thin you want your sauce. You don't want it to be too watery. Add the crumbled bacon and mix to combine. Allow the contents of the skillet to simmer for about 5 minutes. Garnish with additional basil and red pepper flakes, if desired. Look for some posts next week about my recent trip to Seattle and Im off this week to Cedar Rapids, IA! 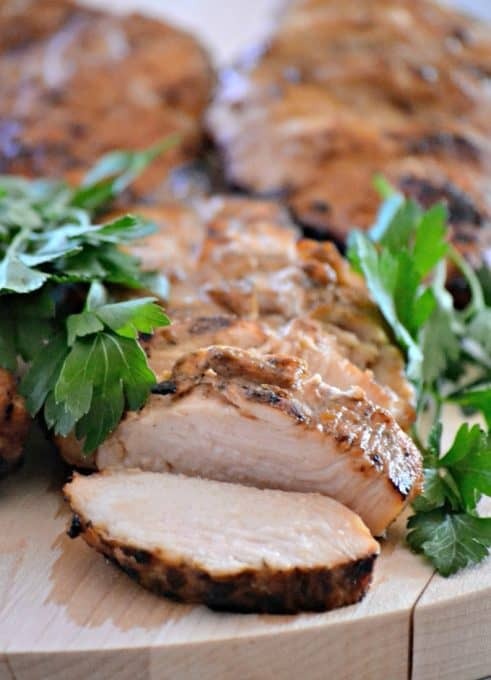 Take a look at these great chicken recipe videos, too! This looks amazing, all of my favorites in one dish! Sun-dried tomatoes are so good in pasta! Thanks, Holly! 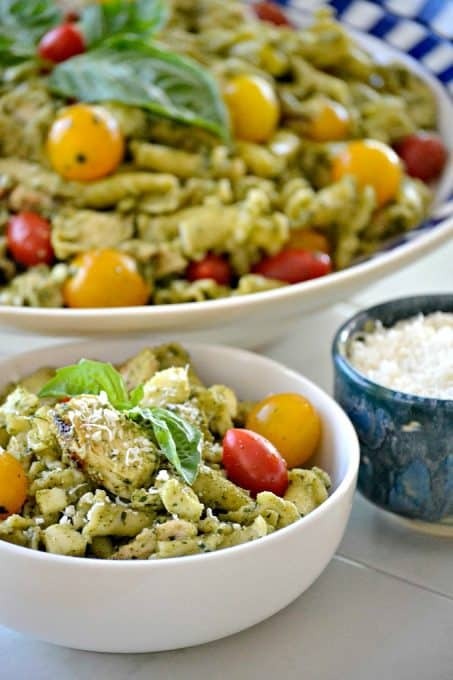 It’s hard not to stop eating this dish, especially with all of those sun-dried tomatoes! Thank you, Pat. I hope you like it! I sent it! Please sign up for my weekly newsletter! Hi Lynne please send me the recepie this i must try thankyou! Can I ask what half and half is in the ingredient list ? Lena, half and half is a combination of half whole milk and half heavy cream. So use both of those in the recipe to substitute for the half and half– 1/2 cup heavy cream and 1/2 cup whole milk. Hope you like it! I am assuming that half half is some sort of cream, as we don’t have that in Australia. Am I correct? This sounds very yummy and I will try very soon. Thanks. Yes, Solange, half and half is a combination of half whole milk and half heavy cream. You can use both of those in the recipe – 1/2 cup heavy cream and 1/2 cup whole milk. Hope you like it! Pat, because they’re chicken tenders, they’re thinner and don’t take as long to cook. They’re cooked for one minute on each side initially and then added back to the pan to simmer in step 8 and will be completely cooked through. Hope that helps! Love farfalle. Coz its shape’s like a ribbon. Cute! Thank you, Joanne. Half and half is a mixture of equal parts of light cream and whole milk. will this freeze? I have a new first time mama as of last Fri, whose own mom went into a coma a month ago from a long time medical condition, and her hubby is deployed, so I am cooking dinners for the new mom and her dad. She is our daughters close friend from their time at college in biology lab. Could I substitute the half and half for something with less calories? Maybe 2% milk?? And can leftovers be frozen? Is this spicy as I’m hoping to make for a new mom who is breastfeeding. Shannon, it’s not that spicy, but in this case, it’s a dish I wouldn’t suggest for a breastfeeding mom. You could omit the red pepper flakes, but the recipe calls for 1 tablespoon of paprika and the only substitutes for that that I’m finding are all sorts of chili powder or spicy substitutes. 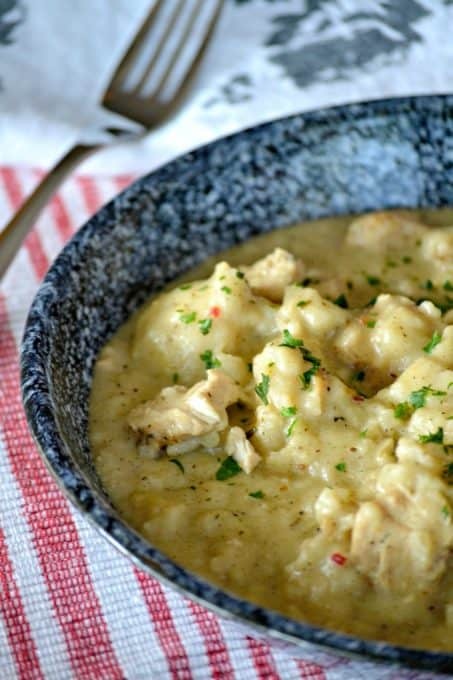 Your best bet might be this https://www.365daysofbakingandmore.com/day-112-chicken-noodle-casserole/ (sorry, don’t know why the link’s appearing this way). Hope it helps! I need to thank you, too for bringing to my attention that I need to get busy making more dinner recipes for the blog. Time to get to work! How many servings does this make and what size are the servings? It will generously serve 4 people. This was a huge hit! Glad I tried it. I used smoked paprika, so that added a nice flavor to the dish. I didn’t have bacon, and definitely did not feel the dish was missing anything. I will probably add some green peas to it next time I make it. Husband declared it was great upon 2nd bite! I’m so glad you liked it and yes, smoked paprika will add some great additional flavor. Thanks so much for letting me know! Erica, it will serve 4.